Could Transcranial Brain Stimulation Help Sharpen Memory? : Shots - Health News Memory faltering as you age? Parts of your brain that used to work in sync may be out of step. A study shows that a precise jolt of electricity can bring these parts back together, boosting memory. A lab member tests transcranial brain stimulation on a research subject at Boston University. But as we age, these brain areas start falling out of step, and these once tightly linked brain areas are no longer on the same page. A study published Monday in Nature Neuroscience demonstrates a link between these mismatched brain rhythms and declines in working memory in older adults and shows that a precise form of electrical stimulation applied to the scalp can coax these brain areas back into sync. Applied to the brain via a skullcap studded with electrodes, an experimental form of transcranial brain stimulation delivers alternating current to a small group of neurons to nudge them to a specific wavelength. Imagine two giant pendulums swinging at different rates. The brain stimulation nudges each pendulum with a pair of electrical hands pushing at the same frequency, causing them to sync up and swing synchronously. What happens when these electrical hands sync the mismatched brain areas? In the study, older adults' performance on one measure of working memory improved to the level of younger adults, and the effects lasted at least 50 minutes after stimulation. "In terms of this working memory task, we made the brain of a 70-year-old look like that of a 20-year-old," says Robert Reinhart, the Boston University neuroscientist who led the study. He says it's the first time that a study has shown that disconnected brain areas are tied to deficits in working memory in the elderly, and that transcranial stimulation can bring these areas back into sync. Jared Cooney Horvath, a neuroscientist at the University of Melbourne who describes himself as generally skeptical of brain stimulation research, found this study compelling. "In short, I wanted to dislike this paper, but it appears to show exactly what it sets out to show,"
Applying weak electrical current to the scalp is not a new concept. It goes back as far as ancient Rome, where Scribonius Largus, physician to Emperor Claudius, laid live electric torpedo fish across the heads of headache patients. Transcranial electric stimulation is the modern version of electric fish , and it generated renewed interest in the early 2000s, with papers demonstrating how one form of the treatment, applying a weak, one-way current, could excite or calm large swaths of neurons. Other work suggested that it could improve motor learning. Later research found that weak electric current could synchronize the activity of populations of neurons, making them fire together. Many in the field began exploring how tweaking this synchronized activity might induce behavioral changes, like boosting memory. The research also spawned an active, and potentially ill-advised, DIY community of brain stimulation enthusiasts who swap protocols on Reddit forums for improving learning or relieving depression. Many experts advise against this, claiming we still have much to learn about what noninvasive brain stimulation actually does to the brain, and that improper use could be dangerous. That's why studies like this one are so important, says Marom Bikson, a biomedical engineer at the City College of New York. Bikson was not involved in this study, but developed the brain stimulation technique used by the authors, a more targeted form of brain stimulation known as HD transcranial alternating-current stimulation or HD-tACS. These authors set out to rigorously test the underlying biological mechanism driving poor memory — mismatched brain rhythms in the temporal and prefrontal cortex — and observe how stimulation can affect them. 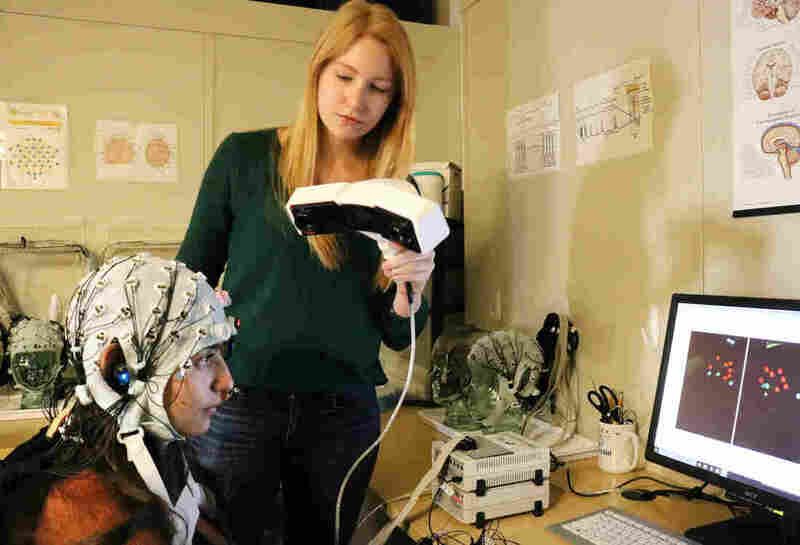 To do this, the researchers gave a group of younger adults and older adults a working memory task while hooked up to an EEG, which can measure brainwave activity in both regions. An image flashed on a screen, say a fire hydrant, then the subject would see a series of other images, and would have to distinguish images they'd seen previously from new ones. As expected, older adults were significantly slower and less accurate than younger adults on the test, and this poorer performance was associated with uncoupled brain rhythms. But to show that these out-of-sync circuits are actually causing working memory deficits, the researchers needed to go a step further. They needed to show that putting these areas back in sync boosted working memory performance. The researchers did just that, using HD-tACS to tap into existing oscillations of precise brain areas and nudge them back into rhythm. Further, the researchers could tailor the frequency to each individual based on the EEG data they collected. Using a double-blind setup, where no one involved knew who was getting stimulated, the researchers placed a special cap on all participants as they did the memory exercise. Older adults who received the brain stimulation were just as accurate as younger adults during the 25-minute stimulation period and continued to show improved performance for 50 minutes after the stimulation ended. When Reinhart looked at the EEGs from the older adults who were getting the treatment, he found that their temporal and prefrontal cortex were in sync, just like a younger brain. "Not only did we find that a decline in working memory is due to specific brain circuits becoming disconnected, but we also were able to noninvasively stimulate these faulty brain circuits in the elderly to rapidly boost their brain and memory function," says Reinhart. The researchers also reversed the stimulation delivered to younger adults, temporarily desynchronizing their rhythms, and found their working memory declined, further demonstrating that synchronization between these brain areas is critical for working memory. Finally, Reinhart took the poorest performing young adults from the first experiment, and stimulated their brains to synchronize these brain areas. The result? A boost in performance. "I'm really excited by this paper," says Bikson. "It advances the needle towards establishing a rigorous scientific base for this kind of brain stimulation technique." Horvath and Reinhart both caution that much more work remains before you can strap electrodes to your head and expect a cognitive boost. "While these results are compelling, this is just one study from one group," says Horvath. "I'd like to see this replicated by other labs, and extended to test other aspects of working memory." Horvath says this kind of boost in performance, while statistically significant, may not be clinically significant. "Within each trial young adults got about 24 of 26 images correct, while older adults got about 22, and were boosted to about 24 with stimulation," he says. "I'd question if this bump has any real-world or clinical value." Further, more research will need to be done to investigate whether these boosts last long after stimulation. "At some point, you want to have these benefits without wearing an electrode cap," says Bikson. This study didn't test the participants again after 50 minutes post-stimulation, so it's possible they had a boost that lasted longer, according to Reinhart. He says other brain stimulation studies have found changes in cognition that last for days, or even weeks. But is this stimulation just providing a temporary crutch? Or is it inducing lasting changes in the brain? "A lot more research needs to be done to answer that question," says Reinhart. "Still, it's pretty exciting to think that we might be able to just apply this stimulation and sync up your brain rhythms in a way that could sustain themselves on their own, providing a lasting boost in cognition."